Turn the clock back to 2004. The last evening of 2004, in fact. We were in South Lake Tahoe where we'd spent the most brilliant, Heavenly day, ever, snowboarding. Eight feet of snow, blue skies and sunshine. We were Happy Boarding Bunnies. New Years Eve is a tricky one in my book. So much expectation of having a good time invariably leads to disappointment. The five of us decided to simply have a nice dinner instead of trying to party, party, party into 2005. All of us agreed, we wanted a fondue. D, my exroomate, and I had been to the Swiss Chalet a couple of years earlier and were both of the opinion it deserved a second visit. I've eaten fondue many times in the Alps, so I have an idea of what it should taste like. I was pretty certain, that Fred, the discerning Frenchman, might find the Swiss Chalet version acceptable too. The Swiss Chalet is an institution. It has been open for no less than 48 years. It actually looks like archetypal Alpine Chalet, which adds to the charm of the experience. The decor is certainly not stylish or modern(picture top/mid). When we arrived we started with Kir Royales at the bar(picture top/left). Well, at least the girls did. They didn't have cassis, but Chambourd worked just fine. The bar tender was friendly and we had fun chatting with him whilst we waited for our booth-table to be prepared. All entrees are served with soup or salad. We chose the salad (picture top/right) with the house dressing. Very European, quite old-fashioned with a slice of smoked ham and old-style veggies like crinkle-cut beetroot and huge onion rings. Still, it was very good, the dressing was extremely tasty. This salad comes highly recommended by me. It's not the slightest bit, trendy, beautiful or Californian, but it tastes darned good. D and I remembered we had loved the side order of Fresh Mushrooms sauteed in Butter ($5.95) on our previous visit so we decided to order a serving to share as another appetizer. Like the salad, these look dated compared to the kind of dishes you expect to see on menus in healthy California these days. But when it's snowing outside and you're eating the last meal of the year, a treat like this is deserved. The ample portion of juicy, buttery, succulent button mushrooms is delicious. Make sure to order some if you visit! We over-ordered. A 3 person cheese fondue and 3 person meat one too. Between just five us. Errhmm. Maybe we were being a little bit optimistic about the stretching qualities of our bellies. We were hoping both fondues would come together so we could mix and match between the heavy cheese and the lighter meat. But the timing in the kitchen went wrong and they, in fact, arrived one after the other. The cheese came first. 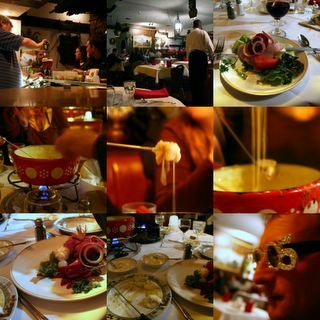 (pictures middle row) Yummy, gloopy, cheesey, delicious cheese fondue in a weathered pot. Served with bread. That's it, just bread, just like in Europe. No boring broccoli florets or health-conscious carrots to dip in this baby, just low-fibre carbs and a bucketful of fatty protein. Yum. It was really tasty and good. When you order a meat fondue, you are given a plate of cubes of raw steak (picture bottom/left) which you cook to your personal taste (in my case, read "flash fry" or "hardly at all"), in a vat of bubbling oil. The idea, thereafter, is to dip your meat in one of the delicious sauces provided - aoli, horseradish, bearnaise, mustard, etc. (picture bottom/middle) The meat was good quality and tasty, indeed, so good that one of our group ended up eating hers raw. The Swiss Chalet certainly isn't a hip or stylish place. The staff are not perfectly accomplished wait staff but they are wonderfully friendly and entertaining. The food isn't elegant, but it really isn't too far from authentic. Our delicious, end-of-the-year meal left us all full, happy and completely satisfied with a bill, per person, of $46 each, including wine and tip. Thanks for the review. I've been meaning to try this place, and with your review maybe now I'll finally get motivated to give it a shot. Sounds yummy Sam makes me yearn for a skiing holiday but I'll just have to opt for finding out my fondue. I think I'll do a meat one for Dillon's birthday, he loves it and it's much easier to clean than a cheese one!!! Thanks for the review. I've recently stumbled across your blog and I'm definitely going to stick in my bloglines queue. I really appreciate a reviewer who can be so open and flexible with their food tastes! I'm definitely going to stick in my bloglines queue. BTW, I grew up in Placerville, CA (on the way to South Lake Tahoe on Highway 50) and I have another recommendation for an old-school restaurant for apres ski. OK I don't know the name of it, but it is between Pollock Pines and Kyburz--the first restaurant after the highway goes from 4 lanes down to 2 as you go up the hill (and, thus, the last on the way down). Great German food. If there is a kraut or brauten that you are craving after a cold day on the slopes, this is the place to go. Hi. I don't know what to ogle at more, the snowy slopes of Heavenly or the fondue. I had some aligot this summer whilst yurt shopping in the Aubrac. Gloopy and yummy. Hits the spot if you've been burning calories all day doing something. I hadn't been but it hit the spot just the same. I've got a soft spot for Raclette too - whether it's the machinery involved or the melted cheese I can't decide... ok it's the cheese. 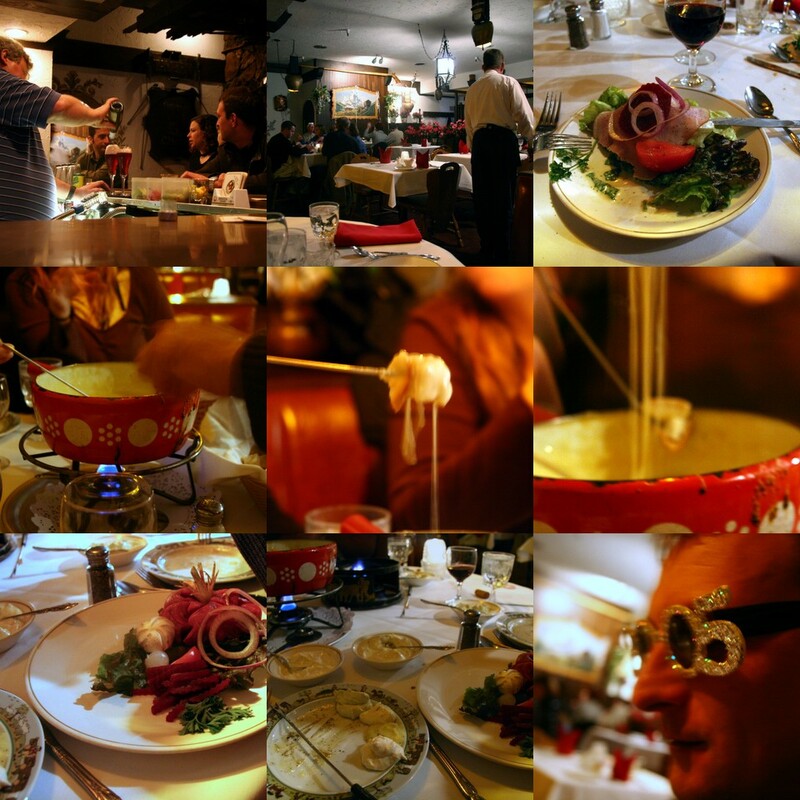 There's this joint in Banff called the Grizzly House that is a combination fondue and rock cooking spot. You walk into a cloud of smoke as the patrons are searing snake, boar and ostrich on hot rocks whilst dipping veggies into melted cheese. An absolutely surreal experience, you cannot leave without smelling like garlic butter and burned meat. Bizarre. Anonymous 1 - I hope you like it. If you accept it for what it is (not fancy) I think you will enjoy it. Beccy - I wish we could all go skiing together one day. I am sure the kids would love it. Anonymous 2 - thanks for the German place in Placerville tip. usually we go to North Lake, but next time we are south I will look out for it. Thanks for putting me in your bloglines, I hope you enjoy future posts! Debra - everything in the world would be easier to eat if we spent all day burning calories, eh?! Miro - I am enjoying your new blog btw, I can see why you shudder at the thought of the Canadian version of Swiss Chalet. I checked out their website and I don't think I'll be hurrying there any time soon. Fondue is defnitely not an occasion for wearing your best dry-clean only clothes for! The summer between my sophomore and junior years of high school, I spent a week in Tahoe with my best friend and her mother. After a day of driving around the lake, hiking, and horseback riding, we were all starving and just wanted to eat. We stumbled upon this place and had a glorious dinner. I can't remember what we ate, but I remember loving it and thinking that I must visit again someday. Everytime I go to Tahoe I forget about my earlier promise. Your post reminded me. Our next trip is in January and I am making it a must-do item. Thanks! thanks sam! we have a house in tahoe, and have been meaning to go to the swiss chalet for months and months (in fact, googled it and your blog came up). now we're definitely going to go! The place thats in between Pollock Pinks and Kyburz is called the St. Pauli Inn. Serves the best German food this side of the Sierras. I have nothing to complain about the service or the food, but the owner of this restaurant is nothing else than a ROBBER! Be careful and when you get your bank statement check that they didn't take more than what you signed on the receipt. Another solution is to use cash!! I signed for $39 and they took $41 which is totally unacceptable!!! The best way not to be robbed in this restaurant is just to stay away from it!!! Anon - do you know about the fact that when they run your card at a restaurant they can legally take an extra percentage to allow for tip projection and then it is adjusted to the actual amount when the bank receives the slip? This is common accepted practise for restaurants because they run the card before you leave a tip. Perhaps your bill will be adjusted to the correct amount when the bank receives the slip in a few days. Have you actually called your bank or the restaurant to ask them about the extra 2 dollars before accusing them of robbery on my blog? Please report back and let us know how you get on. After a few years of meals at the Stateline casinos, we returned to the Swiss Chalet for dinner. We used to like the Sage Room at Harvey's Casino until a few years ago, when we noticed a decline in quality. So, while in Tahoe last week for our last ski trip this season, back we went to the Swiss Chalet, and the food was as wonderful as we remember! We had Citron Cosmo cocktail, Seafood Bouchee appetizer, Salad with House Dressing, St. Moritz Wienerschnitzel, coffee and some kind of chocolate-cream cake. Everything was super, from the cocktail to dessert. We spent $115 for 2 of us, including tax & tip. Thank you for the review that we whole-heartedly agree with (altho we did not have fondue); and thanks also to the Swiss Chalet!